STAN SCHMIDT'S 'EARLY BIRDS'. By Colin Smith. MIKIO YAHARA 8th Dan.Interview By Dyankov Yavor & Larionov Oleg. DIFFERENT WAYS OF EXECUTING KATA. By Dirk Heene. WHAT HAVE WE BECOME? By Mike Clarke. THE BENEFITS OF KEEPING A TRAINING DIARY. By Paul Walker. KATA: THE IMPORTANT PRINCIPLES. By Avi Rokah. SUBSTANCE OVER STYLE. By John Cheetham. Many Shotokan people will know of the tough reputation of South African karateka, and they don't come any tougher than sensei Stan Schmidt and his senior students. Many Shotokan karateka will also have heard of the infamous 'Early Birds' class which Stan developed and oversaw for three decades. One brave soul who trained for many years in those sessions is South African rokudan Colin Smith who now resides in Chicago. 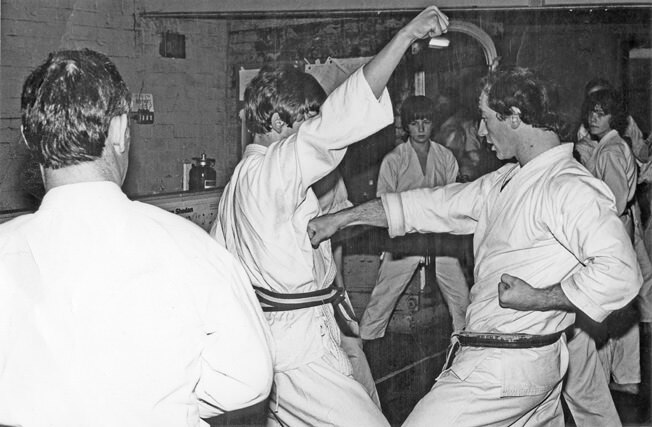 Colin's brilliant article recalls the fearsome (some would say mad) training that they used to endure with sensei Stan Schmidt and the Geyer brothers, Derrick and Keith; it's not for the faint hearted! We also have an interview in this edition with the renowned sensei Mikio Yahara the former dynamic JKA fighter and equally dynamic JKA kata champion. Of course Yahara now heads his own Karatenomichi organisation and has done for several years. We have read many times in the past about the so called connection with sensei Yahara and the Yakuza, (The Japanese equivalent to the Mafia) but never has Yahara sensei spoken of this in such detail in an interview before. Here, he talks about his work outside of karate and he tells the full story of the Yakuza connection which makes fascinating reading. This particular karate sensei is a very colourful character who has led what some would say is a dangerous life, both inside and outside of the dojo. The severity of his early karate training experience with his instructor Yano sensei is quite unbelievable but you can see how it obviously forged Yahara's indomitable fighting spirit. 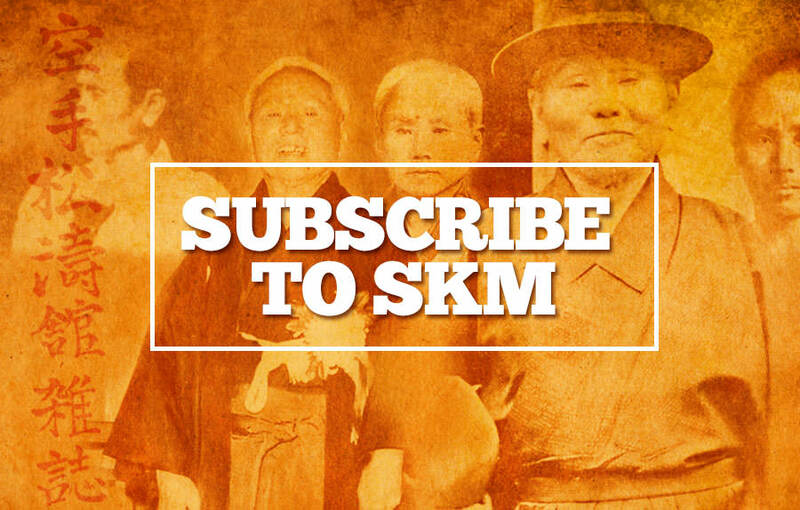 It's great to welcome back Avi Rokah as a contributor to SKM. It's been some time since we had an article by Avi but hopefully there will be many more to come. Avi Rokah has been a student of Nishiyama sensei in Los Angeles for over thirty years and is a vastly experienced instructor in his own right, with his own dojo also in Los Angeles. His article deals with the important principles of Kata; it's certainly one of the many different ways of looking at the overall concept of kata. Dirk Heene's article also focuses on kata and the different ways of executing kata as practiced by the students of the late Kase sensei. These methods are not what most mainstream Shotokan karateka will be used to. Kase sensei introduced the idea of practicing kata in various directions into Europe. He used to do this at the late Enoeda sensei's Crystal Palace (London) summer courses which caused some confusion in the early days, as up until that time it had never been seen in this country before. Paul Walker's article I felt was well worth using because many students have done this over the years; kept a training diary. I know I did for the first few years of training and I wish that I had carried it on much longer because the benefits are priceless. When you take a class with a knowledgeable instructor and make notes after the lesson, you can always come back at a later date and re-remind yourself of any important points. It makes good sense, at all levels. SUBSTANCE OVER STYLE By John Cheetham. Many years ago when I was a student at a music college (studying percussion) I went along to watch an audition (for a drummer) for an up-and-coming rock band called 'The Kinks' (who later became the worldwide supergroup). Out of about thirty drummers, one stood out by a mile, he was an incredible technician and a stylish showman to go with it. Straight out of the Keith Moon (of 'The Who' fame) mold. Everyone thought that he was a certainty for the job. However, Ray Davies, the leader of The Kinks, decided on another guy because he said that although he was not technically as good, or showman-like, that he was, rock-solid and had great timing and had a much better FEEL for the type of rock/pop music the Kinks were making. He chose substance over style! A few years later when I started karate this got me thinking about an aspect of karate we often overlook. Allow me to relate a true story which happened 26 years ago (1981). We had a young brown-belt training with us at the time, who had started as a beginner and had developed very quickly, and after about two and half years was technically unbelievable. I can't recall his surname but his first name was Peter. He just had an ideal body for karate; kicks from outerspace, perfect, beautifully balanced movement, you know the type (lucky sod). We all thought he would waltz through his Dan-grade exam when it came up. But firstly he had to take his 1st kyu examination which was now due. The grading examiner was sensei Terry O'Niell (we were with the KUGB at the time). We watched Peter sail effortlessly through the kihon and combinations part, and give a technically faultless rendition of kata Bassai-dai and Heian sandan, then partner-up with a much older, fellow brown-belt for the jiyu-ippon and jiyu kumite part of the exam. We all thought, "No problem here, a definite pass, with flying colours". Well, shock, horror and surprise was to await us all - and none more so, than the very confident Peter. The young sensei Terry O’Niell (right) demonstrating ippon kumite (circa 1976). After the grading was over sensei Terry O'Neill sat everyone down in the dojo and awarded all the various grades to the fifty or so students. Some passed, some got temporary grades but no one failed, except one. He explained that it was no disgrace to get a temporary grade, because they had all shown good spirit and the correct attitude, even if they were not so good technically or had made a mistake in their kata etc. Now he came to Peter, one of five students who had taken 1st kyu. I think three passed and one got a temporary grade. We were all eagerly expecting Terry to sing Peter's technical praises as an example to us all. I remember his exact words because I (like everyone else) was totally shocked! You have one of the best overall techniques I have seen in years. Karate comes very easily to you because you have an ideal body for karate and you are naturally a very good athlete, you would probably be excellent at any sport you tried, you are a very lucky boy. But you show absolutely no feeling or passion for karate whatsoever. You do not have the right spirit, or attitude. Karate is far, far more than just physical technique, in fact this is definitely secondary. The most important aspect in karate, is 'spirit' and the correct attitude, and you, showed none at all. You're very stylish, but your karate lacks substance. He then very politely pointed out to Peter that for this reason he had failed the 1st kyu grading exam. We never saw Peter at the dojo again after that grading day. He never came back to training, we heard that he just packed it in? It made us all think very hard about karate training after that event and especially such comments from sensei Terry O'Neill, who was known for his quite amazing technical ability, but equally for his indomitable fighting spirit. At the time we used to train four times per week and Friday night's were mostly kumite and it was VERY rough sparring in those days with far too many injuries! Peter rarely trained on Friday's, he always had some excuse or other and because he was technically so much better than anyone else, no one ever mentioned it or thought anything of it? In the late 1970's to mid 80's here in England there were many competitions between Kung Fu teams and Shotokan teams (and individuals). Some of the Kung Fu boys were fantastic but some were crap, but often extremely FLASHY. I recall seeing a fight with one such Kung Fu guy and a little, stocky Shotokan guy. The Kung Fu boy shot straight out and attacked with what I think was called a 'whirlwind' kick. He missed! Next he launched a flying yoko-tobi-geri (of sorts) and the Shotokan guy just moved out of the way, like he was biding his time. The third attack from Jumping Jack Flash was a triple spinning something or other ending with an axe-kick! As he landed the Shotokan guy nailed him with a perfectly timed, beautiful (simple) gyaku zuki chudan (just under the heart). You heard the THUD all around the area. The Kung Fu guy went down like he'd been shot! And he didn't get up, he was carried off on a stretcher. To an outsider it must have looked like a terrible mis-match until the final outcome: Substance over style. Of course there is nothing wrong with being stylish and technically excellent, we would all like those qualities but it must contain 'substance' and very importantly, the right spirit, passion, feeling and the correct attitude or it will fail to connect with people. Karate, Art, Music, it's all the same: hopefully, "Substance over Style" will always win the day.